I saw the introduction of this exhibit on the SFMOMA newsletter, the photos they chose to show on both print and web didn’t impress me. Another realistic painter, I thought to myself, why not just get a camera? We were in SFMOMA today so we checked out the show. Surprisingly, I fell in love with Bechtle’s paintings. There is something astonishingly beautiful in those canvases on the wall, and that beauty was completely lost in print or on a monitor. It was the quality of light in the Bay Area. It was what I always love about sunny days here. His paintings captured them so well. Astonishing. 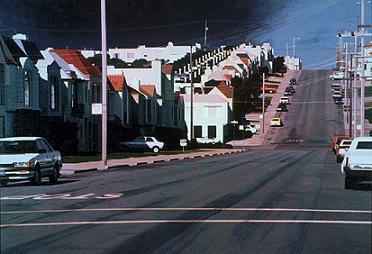 Even though his subject matters seemed so mundane: concrete drive ways, hilly but tree-less streets, rows after rows of two-story houses with featureless bay windows. The light fell onto them made them shine, almost translucent. Those clean and crisp light of Northern California, fluid, sparklingly alive, passed from frame to frame, illuminating the simple composition, captivating me, making me speechless. When we walked out of the exhibition hall, Mi turned to me, “He is painting light.” Yes, that’s it. He is painting light. He is painting the essence of light, the happiness of light. Something above and beyond the reality could have been captured by a camera. 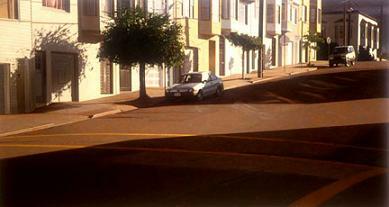 The earlier paintings were from Alameda, and the more recent ones are based largely on Potrero Hill district of SF. We’ve been to this intersection quite often because there is a Muslim restaurant we liked called Old Mandarin about two blocks away. I have never seen sky like this there. But how i love that light! Here is another one that i really love. Strawberry season is here. 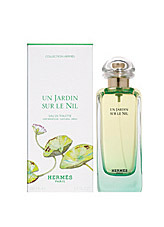 I¡¯ve been tempted ever since I saw the huge box of them at COSTCO a couple of weeks ago. Knowing that half of them would go bad before Mi and I could finish them. I didn¡¯t buy it. Saturday at the supermarket, I couldn¡¯t resist any more and brought home a 16 oz box. Thus came a strawberry morning to our little breakfast table. Strawberry pancake and strawberry with whipped cream. Yummy. The festive looking color brightened a morning with sun and clouds. The rain had ceased, temporarily. –	Banana and shredded coconut, yummy! –	Pear and shredded coconut, the flavor of pear was wonderful! But the fragrance of coconut is not as pronounced as with banana. –	Strawberry, lovely. Because the slightly sore taste of a strawberry, the pancake goes really well with some whipped cream. Baked some cookies on Sunday afternoon. It was the kind that everyone¡ªMom, Gui, and Mi¡ªseems to like the best among all my baking experimentations. In the cookie book, it is called ¡°Mexican Almond Cookie¡±. I¡¯ve been making it with some of my alterations, with Walnut instead of Almond, and not as sweet. Here is my recipe. 3.	use your hand to work diced butter into the flour mixture, until you get a ball shaped, well mixed dough. 4. The recipe then asked you to roll the dough into a thin layer, roughly ¼ inch thick, and started cutting it into round cookie shape. I found it better to make it into a small round cookie rather than a large one. Because the cookie came out to be very brittle, with a big cookie, you get cookie crumbs everywhere. So I made them into bite sized. Also, I found it easier to follow mom¡¯s example of making dumpling skins. First to divide the dough into roughly 3 or 4 portions, roll each into a thin cylindrical shape, with the diameter of 1 inch, then slice the cylinder into ¼ inch pieces, and place each piece onto the cookie sheet. 7. Take it out of the oven and let it cool down. Otherwise it is too soft to handle. 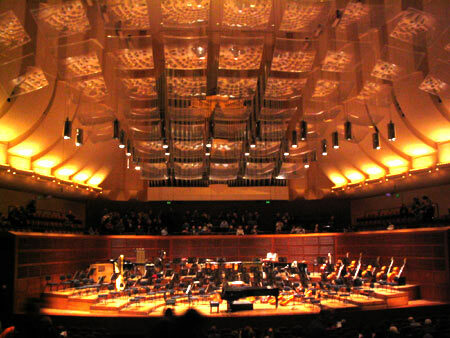 On the first Saturday of 2005, we went to SF Symphony¡¯s box office to order tickets of Lang Lang with China Philharmonic Orchestra concert, which was scheduled for March 6th. ¡°Ah, Lang Lang! 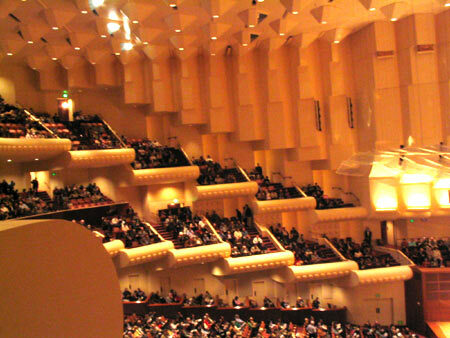 Everyone wants to see Lang Lang!¡± The high spirited gentleman working behind the box office window exclaimed. He checked on his computer and informed us that all tickets on the left side of the stage had been sold out. But he got us some good tickets on 1st Tier on the right side of the stage. Lang Lang the piano Prodigy. Born and raised in northern China, Lang Lang started taking piano lesson when he was 2, went on stage and won his first award at the age of 5, moved to Beijing to study at the age of 8, moved further to the US at the age of 15. By chance, he was the replacement for Andre Watts in an international music festival held in Chicago. That performance of Tchaikovsky Piano Concerto set his stardom in motion. 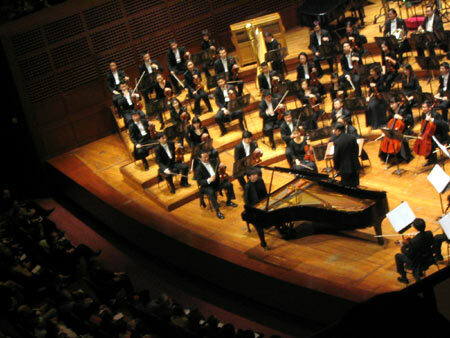 The audience leaped to their feet at the end, Lang Lang, the star, started its joyful ascend. That year, he was 17. China Philharmonic Orchestra was a pleasant surprise. I was thoroughly impressed. Majority of the 120 musicians looked to be in their twenties. The sound they conjured up was beautiful, let it be the exciting sequence of The Tsar’s Bride or the moody sorrow from ¡°Moon Reflection¡±. The latter touched me deeply. Not sure whether it was due to the high contrast of such eastern sound inside such western settings, my tears were out of control throughout the entire piece. Rhapsody on a Theme of Paganini was the showpiece for Lang Lang. But often I found myself enjoying the orchestra just as much. At the very end, when the entire orchestra morphed into one entity of trembling sound, the slightly metal quality of the music transformed the orchestra into one giant leaf, trembled against the powerful rain storm of Lang Lang¡¯s piano. What joy that was! My heart leaped! I was beyond myself. The second half of the concert was rather modern. I¡¯m in general remaining skeptical toward modern arts, modern classical music included. Too many of them sounded borderline noise to me. But the two pieces chosen by this orchestra turned out to be mildly enjoyable. Ye Xiaogang¡¯s Das Lied von der Erde had the red-clad Luwa Ke sang ancient Chinese poems from Tang Dynasty, the orchestra contributed occasionally Peking Opera style drum and percussion sound. I was especially fond of the last two pieces. With its relatively quieter sound affect and the creative use of percussion instrument to simulate the bell and drum of a Chinese temple. I was captivated when the sound of a lone Luo slowly died down, and the light pattering of a large drum slowly fading away. That unique sound of solitude so typical of an Asian temple was perfectly recreated on stage. Fascinating. Someone said on the Chinese BBS that the reason of choosing ¡°The Miraculous Mandarin¡± was to show off this young Orchestra¡¯s excellent techniques. Maybe she was right. But I truly enjoyed the piece. In Mi¡¯s words, it was very satisfying to watch everyone on stage working so hard throughout the entire piece. What more can an audience ask for? Here are more photos from the night at symphony. Something amazing happened last night. After dinner, I spent the evening reading instead of surfing the net. 🙂 Came upon a fascinating article in the newest New Yorker magazine on ¡°VOLTAIRE¡¯S GARDEN¡±, by Adam Gopnik. The article gave a good mini-biography on Voltaire, and traced his development as a liberal advocate in the political scene. A few excerpts that I liked. ¡°We must cultivate our garden,¡± is that our responsibility is local, and concentrated on immediate action.